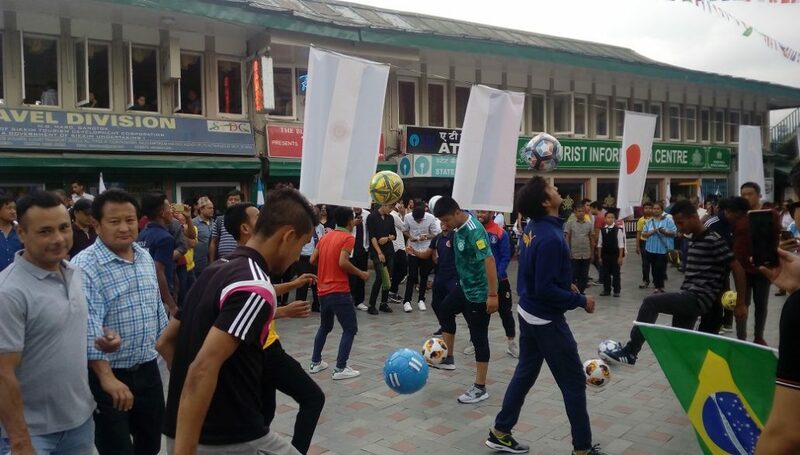 Denizens of Gangtok, the capital city of Sikkim accorded a grand welcome to the world biggest sports festival of this year, the FIFA World Cup 2018 in front of old Tourism Office at MG Marg in Gangtok on Wednesday evening. 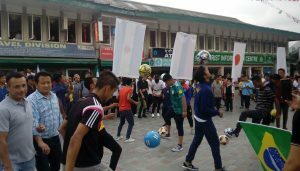 International and national footballers from Sikkim, young footballers of different clubs of the State along with kids and people of Gangtok have joined together to celebrate the FIFA World Cup 2018 with jersey and flag of their favourite teams in this event. FIFA World Cup 2018 is kicking off on Thursday in Russia. On this occasion, Football Clubs Association of Sikkim [FCAS] has organized World Cup Festival to welcome and celebrate the world biggest sports festival. The venue has been decorated with flags of the World Cup participating teams and having footballers showing their juggling skills. 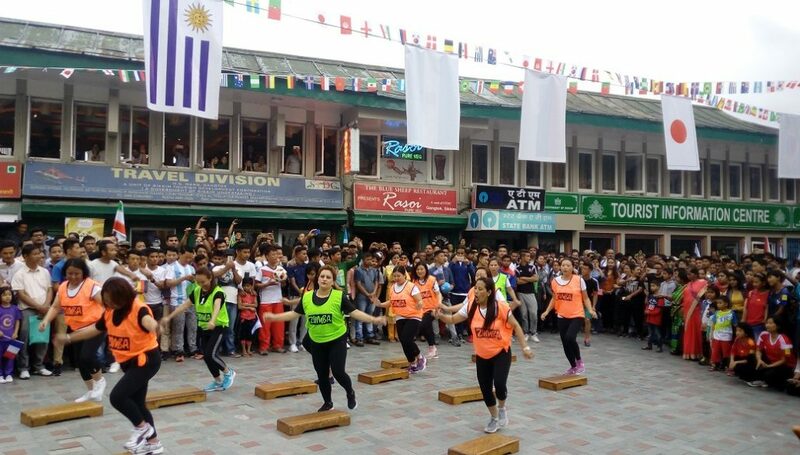 The celebration has also witnessed the performances by Sikkim Police Band along with aerobics and zumba which was also joined by tourists and other colourful activities. The event had Rajya Sabha MP, Hishey Lachungpa as the chief guest and was accompanied by Sikkim Football Association president, Menla Ethenpa, Gangtok Municipal Corporation chairman, Ashish Rai and social workers, T Lachungpa among other dignitaries. The celebration was also joined by popular ISL and I-League players, Nirmal Chettri, Mobin Rai and Kunzang Lachungpa from Sikkim. International footballer, Nirmal Chettri expressed his happiness on being the part of the celebration to welcome FIFA World Cup 2018. He stated that Sikkim is a football loving state and football has been played in every corners so it was a good initiative where the people can come together to celebrate the world biggest sports festival. “Let’s all enjoy this festival and to support our favourite team,” he said. He stated that such initiative in the sports field needs to be continued. “England is my always favourite team in the World Cup. I have started supporting England due to David Beckham during my childhood days and still this team is my favourite to support in every World Cup,” Nirmal said. Likewise, SFA president, Ethenpa expressed that football is in the blood of every Sikkimese, so it was a great occasion where people have came together to celebrate and welcome the world biggest sports festival. He congratulated FCAS for taken such good initiative by bringing in the people together. FCAS general secretary, Sumeet Thirani mentioned that the main objective of the event was to bring the people together to welcome the FIFA World Cup 2018. He also thanked everyone for their active participation to celebrate and welcome the world biggest sports event.